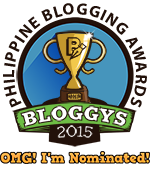 Salamat po sa netizen/s na nag-nominate sa ating blog for the BLOGGYS 2015: Philippine Blogging Awards 2015! We're happy to inform you that psychometricpinas.blogspot.com has been nominated by several netizens in #bloggys2015, Philippine Blogging Awards. It is a nationwide event that aims to recognize the best Filipino blogs and bloggers. It's currently nominated in the Computers and Internet category. 8.) The Awards Committee will publish a list of all qualified nominees in the BLOGGYS 2015 website on October 5, 2015. 9.) Anyone can cast their votes from October 5 to 31, 2015 in the BLOGGYS 2015 website. 10.) Only those with valid email addresses and mobile numbers are allowed to cast a vote. A confirmation request will be sent after each vote is cast. 11.) A reader can only cast one (1) vote per nominated blog, but is allowed to cast votes on other blogs and categories as well. 12.) Please don’t try to find loopholes in the voting system. All votes will be validated by the Awards Committee.